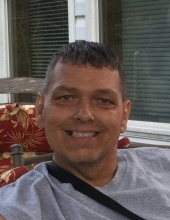 Tony Lee Burdette, 49, of Given passed away peacefully Saturday, March 30, 2019 at CAMC Memorial Hospital surrounded by family and friends following an extended illness. He was born June 19, 1969 in Charleston a son of Larry Dale Burdette and the late Louetta Dean Siders Burdette. Tony worked for KLX Energy Services where he was employed as an engineer. He was also an avid Dallas Cowboys fan. Most of all he shared a special bond with his son Nick who was not only his son but his best friend. Tony is survived by his loving wife of 29 years Regina Fisher Burdette; son Nick Tyler Burdette; Brother Larry Burdette Jr (Hye-Yon) of Bowie, MD; Sister Tammy Harper (Joe) of Sissonville; mother and father-in-law Gene and Janet Fisher of Given; brother and sisters-in-law Randy Fisher (Shannon) of Given, Renita (Jeff) Harrison of Pt. Pleasant, Renee Shamblin (Ronnie) of Kenna; nieces and nephews Savanna Burdette, Kevin Burdette, both of Bowie, MD, Casey Webb of Charleston and Zach Harper of Charleston, Stacey Walraven of Louisville, KY, Samantha Fisher of Given, Jason Harrison of Pt. Pleasant, Jeremy Harrison of Bidwell, OH, Ryan Shamblin of Charleston, and Rhys Shamblin of Kenna. He is also survived by his best friend, Brian Jordan, of Hurricane. To plant a tree in memory of Tony Lee Burdette, please visit our Tribute Store. "Email Address" would like to share the life celebration of Tony Lee Burdette. Click on the "link" to go to share a favorite memory or leave a condolence message for the family.